The Minneapolis Parks & Recreation Board (MPRB) recently announced three new park master planning projects including Southwest Service Area. The SW Service Area is all Minneapolis neighborhood parks south of I-394 and west of I-35 including Lyndale Farmstead Park. The plan does not include regional parks such as the Minneapolis Chain of Lakes nor regional trails. The planning process will be guided by a Community Advisory Committees (CAC). The application process has been extended to April 6. If you are interested in determining the outcome of the SW Service Area, we encourage you to fill out a CAC application at https://www.minneapolisparks.org/_asset/848hir/Triple-CAC-Application.pdf. The application also includes more information on the project, CAC responsibilities, time commitments, and the application selection process. Help Needed with Planting in the Roberts Bird Sanctuary! Join the Friends of Roberts to help restore native understory plants in the woodland areas that have been cleared of buckthorn. We have many beautiful, small natives to plant! Bring your own water, gloves, and trowel. Come for as much time as you can spare between 9:30 AM and 12:30 PM. To find the planting sites, look for signs on Bossen Lane inside the west entrance (near the Lake Harriet Bandshell). The Minneapolis Parks and Recreation Board is scheduling a series of community meetings this summer to get input from residents and determine the future of its neighborhood recreational centers. As a neighborhood with a smaller center, EHFNA is definitely vulnerable and closing the Lyndale Farmstead rec center could be an option on the table. You can learn more and have your voice heard by attending an upcoming meeting. The neighborhood association is learning more and hopes to update residents as that information becomes available. Sign up for our eNews (bottom of page) to receive more information. To subscribe to receive timely emails from MPRB about one or more of the initiatives, visit www.minneapolisparks.org/subscribe, enter your email, then select the project(s) you are interested in under the “Planning” section. 3) A proposal by Mayor Hodges and CM Quincy, made public on March 25. The council may be asked to vote on a resolution committing millions of dollars annually to parks as soon as April 15. I appreciate all of the constituents who have gotten in touch about this generally over the past months and about the specific proposals more recently. I hope as many constituents as possible can engage in this important decision. The purpose of this meeting is to share as much information as possible about the various proposals and hear constituent feedback. City staff will be on hand to answer questions about the potential short and long-term funding sources for parks operating and capital budget needs and potential budgetary impacts and tradeoffs. As I have said to many constituents one-on-one and in public communications about this, I support funding our neighborhood parks. I hope we can get to a proposal that has a clear funding source in the short and long term for both streets and parks, that does not increase the levy more than I or my colleagues could support. I also want to ensure this investment does not negatively impact other ward and citywide priorities. There will be tradeoffs to make, and I want me and my constituents to have as much information as possible about what those will be. Your feedback and questions are important to me. If you cannot make it but want to talk with us about parks, please call the office at 612-673-2210 or email me at lisa.bender@minneapolismn.gov. Minneapolis Public Schools is partnering with over 70 public and charter schools to host the upcoming School Fair Showcase. This annual event allows parents to gather information on the school's programs, activities and educational opportunities in one location. Families will also be able to submit their school request forms for the 2016-2017 school year at this event. Request forms can also be submitted online at studentplacement.mpls.k12.mn.us until March 5. To learn more about the School Fair Showcase, visit studentplacement.mpls.k12.mn.us_school_fair_showcase. Thanks to the East Harriet residents, Boy Scout & Girl Scout Troops and a group from Southwest High School that participated in picking up trash around Lake Harriet on Earth Day. A total of 2,000 City wide volunteers participated in the April 21, 2012 Earth Day Clean Up. About 9,000 of trash and recyclable items were removed from our neighborhoods and watersheds. On Thursday, September 11, from 5:00 pm – 6:30 pm, the Minneapolis Park and Recreation Board will host a public information meeting at the Roberts Bird Sanctuary Shelter (4124 Roseway Road, Minneapolis, MN 55409) to discuss the upcoming rehabilitation of the existing sanitary interceptor sewers within the sanctuary. As part of a larger sewer rehab project currently underway, Metropolitan Council Environmental Services will soon be starting work within the sanctuary. Please join us if you would like to know more about this project and how it may affect the sanctuary. For more information about the project, please visit the project webpage or contact Tyler Pederson, MPRB Landscape Architect, at 612.230.6418 or tpederson@minneapolisparks.org. This used book sale continues to grow each year! Donations of books for the sale are much appreciated: children’s books are especially popular at the sale. Drop books off at the park during our regular open hours. No magazines or textbooks please. All proceeds from the book sale will be used to help cover the cost of summer entertainment in the park. Special Event: A performance of “Nalah and the Pink Tiger” will be presented by In The Heart of the Beast Puppet and Mask Theatre at 7:00 pm. The 2014 Pollinator Party is Thursday, July 24 from 5 - 8 pm at Lyndale Park Gardens. The free event takes place on the east side of Lake Harriet on the open lawn just north of the Peace Gardens. Food and beverage will be available for purchase from La Loma Tomales. At dusk, enjoy the Disney movie "Wings of Life" which offers an intimate and unprecedented look at butterflies, hummingbirds, bees, bats and flowers. Sunday, June 8 from noon to 2 p.m. The dog park entrance is located along Kings Highway/Dupont Ave S between 38th and 39th St. Parking is located on street on W 38th and W 40th or Bryant Ave S. Please note there is no parking allowed on King's Highway between 38th and 40th or in the Park Board's operations center parking lot. The Minneapolis Park & Recreation Board (MPRB) Board of Commissioners has approved the creation of a Community Advisory Committee (CAC) to review the process for InnerCity Tennis Foundation's proposal to renovate the tennis center at Rev. Dr. Martin Luther King, Jr. Park (view map). East Harriet has been invited to appoint a CAC member for the project. Interested individuals may be considered for appointment to the CAC by submitting an application. The application may be found here or by emailing info@eastharriet.org or calling (612) 824-9350. The application deadline is April 15, 2014. Become knowledgeable about the tennis center renovation project and its scope. Understand and represent the park and recreation needs of the community and park visitors. Act as community liaisons for the project, participate in public meetings. Advise MPRB staff and consultants throughout the planning process. Recommend to the Board of Commissioners a preferred plan for renovating the tennis center. Three meetings are scheduled for April 24, May 15 and June 5. However, if the review and revisions can be completed in the first two meetings, the third meeting will be cancelled. All meeting are scheduled for 6:30-8:30 pm at the Rev. Dr. Martin Luther King, Jr. Park Recreation Center. Over the years, ownership of the tennis center at the park has changed several times. The existing building and tennis domes are owned by the InnerCity Tennis Foundation on MPRB property. The proposed improvements are intended to improve the program delivery and function of the existing facility. The total cost of the improvements is expected to exceed $2 million and will be funded through private donations and grants. The 2013 Minneapolis Park & Recreation Board summer concerts at Lake Harriet Band Shell begins Monday, May 27 and runs through Monday, September 2. Enjoy Jazz, Latin, Swing, Folk, Rock, Bluegrass, Classical and more 7 days a week, Monday- Saturday at 7:30, Sundays at 2 pm & 5:30 pm. The 2013 Movies in the Parks series runs Friday, June 7 through Saturday, August 24. The mobile program travels to more than 30 parks throughout the summer. Movies start 15 minutes after sunset. Click here to view the 2013 summer lineup of movies and music performances. The Minneapolis Park & Recreation Board (MPRB) Commissioners met on December 12 to approve the 2013 Budget. Lyndale Farmstead Park recreation center hours will remain at current levels. This service and others were funded through an increase of 3% in the MPRB levy on property taxes. The approved resolution to adopt the 2013 Park Board Budget and other 2013 budget-related documents are available for viewing at www.minneapolisparks.org or by calling 612-230-6400. Emerald Ash Borers Have Arrived! Emerald Ash Borers (EAB) have been found in Lakewood Cemetery. That means that some of the more than 5,000 ash trees in areas surrounding the lakes are very likely to be infected now. High value trees can be saved, but most will die. Two free workshops are scheduled to find out what options there are for dealing with this pest. Fall is the best time to treat if that is your choice. Lynnhurst, Linden Hills, and Fulton neighborhoods are creating an educational campaign with surrounding neighborhoods this fall. The purpose of the campaign is to educate homeowners about keeping their leaves out of the street to help the water quality of Lake Harriet and Minnehaha Creek. The education campaign includes posting 12" X 18" signs (similar to one pictured) in yards from mid September through late October. At the end of the 2013 campaign, you can either keep your sign for use next year or the sign will be collected and redistributed for someone else's use in 2014. Please email Lynnhurst Neighborhood Environmental Committee ASAP at Lynnhurst.env.comm@gmail.com if you are willing to place a sign in your yard this fall. Lynnhurst would like to get 30 positive responses before proceeding with the sign order. Kingfield, East Calhoun, CARAG, and East Harriet neighborhood associations are partnering with Hennepin County to organize a hazardous waste collection event on Saturday September 21. The goal of the event is to give residents more convenient, local disposal option for their household hazardous wastes, resulting in cleaner and greener homes once the hazards are removed! Please note, materials are accepted for free from households only, no business waste allowed. September 21, 2013, 10 a.m. to 4 p.m.
For more information, including a complete list of acceptable and non-acceptable items and directions, call Hennepin County Environmental Services at 612-348-3777 or visitwww.hennepin.us/collectionevents. The Walking School Bus continues to grow in numbers and geographical area this year with the key support of neighborhood parents. Lyndale School will host the Minnesota Sinfonia on November 28th. In preparation for this learning opportunity, teachers will be playing the music that the students will hear during the concert in their classrooms. Kindergarten through 5th grade will be performing with the Sinfonia. The University of Minnesota Athletic Department sponsors a project in three Minneapolis schools that gets students thinking about their post high school educations. Goldie, the gopher mascot for the University sports' teams, came to visit the fifth grade classes on November 9th. A few days later the students went on a field trip tour of the University of Minnesota. Click here to read about more fall events happening at Lyndale Community School. Paul Marietta has been selected as the principal for the new Ramsey Middle School effective the 2012-2013 school year. Marietta is currently principal of Bancroft Elementary School. Of his new position, Marietta said, "I believe that a strong relationship between a school principal, teachers and parents is important in order to ensure educational success. I am excited to bring my experiences to Ramsey Middle School and I look forward to working with our school community to develop a strong program that engages students and prepares them for the 21st century". Many of you know that Dr. Steven DeLapp retired from his position as principal of Barton this month after over 20 years of service to the school and community. East Harriet would like to thank Dr. DeLapp for his dedication and service to the students in our neighborhood. He will be greatly missed. Given Dr. DeLapp's retirement, the Minneapolis Public School has announced that Dr. Patrick Duffy has been named as the new principal for Barton. Dr.Duffy comes to MPS from Edina Public Schools where he served as assistant principal at South View Middle School for four years. During that time, he also worked as a diversity consultant for the Carlson School of Management and Bethel University. He was previously employed in Hopkins Public Schools for 10 years as a junior high and high school teacher and an equity coordinator. Of his new position, Dr. Duffy says, "I am excited and honored to be offered the position of principal of Clara Barton Open School. I look forward to serving the staff, families and community to the best of my ability. The Off-Leash Dog Park at Lyndale Farmstead Park will close temporarily on Wednesday, May 1 for finishing touches. The park opened on a temporary basis this January for a “preview” during the winter months to accommodate pet owners who were looking for a nearby area for their dogs to run. This opportunity gave everyone who is eagerly awaiting the new off-leash space to get a sneak preview of what the new park will have to offer. There is still a significant amount of work to be done this spring, so as soon as the snow melts and the ground thaws, the final construction work and landscaping will begin. A grand opening is planned for summer 2013 when the full park will be completed. Sign up for email updates about the project and to get news about the opening by clicking here. · A concrete entrance off of Dupont Avenue with a connecting concrete walk over to the primary seating area. The seating area will include benches and a shade structure. · Landscape plantings encompassing the perimeter of the dog park, providing a soft edge and buffer. Remember that all rules for off-leash recreation will apply when the park reopens and an Off-Leash Permit is required for all dogs. Permits can be obtained by calling customer service 612-230-6400 or online at www.minneapolisparks.org/dogparks. The dog park entrance is located along Dupont Avenue South (Kings Highway) between West 38th and West 40th Streets. Parking for the dog park is on-street on West 38th and West 40th Streets or Bryant Avenue. Please note that there is no parking allowed on King’s Highway between 38th and 40th Streets or in the Park Board's operations center parking lot which accommodates the Park Board’s large trucks and mobile equipment and is locked during non-business hours. Map of Parking Locations. To learn more about the Lyndale Farmstead Off-Leash Recreation Area project in the Sixth Park District, visit the MPRB’s Dog Park project page at www.minneapolisparks.org. The much anticipated Off-Leash Dog Park at Lyndale Farmstead Park is open for a winter month “preview” much to the excitement of dogs and dog owners! There is still a significant amount of work to be done but the Minneapolis Park and Recreation Board (MPRB) has determined the park can be opened on a temporary basis to accommodate pet owners who are looking for a nearby area for their dogs to run for the winter months. NOTE- Parking for the new off-Leash Dog Park is limited to residential street parking on 38th and 40th Streets or Bryant Ave . No parking is allowed on Kings Highway or in the Park Board's Operations Center parking lot adjacent to the dog park. Violators will be subject to parking fines. The Off-Leash Park will close in spring for the remaining construction work with a grand opening planned for Early Summer 2013 when the full park will be completed. The majority of chain link fencing around the park has been installed with the exception of the entrance vestibule. The entrance area will be completed once the granite chip is installed. In the meantime, a temporary fenced-in vestibule will be in its place. The completion of the filtration area is not quite finished. Currently a temporary construction fence surrounds this area so please make sure to keep your pets out of the filtration area. All rules for off-leash parks including Off-Leash Permits for all dogs will apply during this temporary opening season. Permits can be obtained by calling customer service 612-230-6400 or online at www.minneapolisparks.org/dogparks. A concrete entrance will be constructed off of Dupont Avenue with a connecting concrete walk over to the primary seating area. The seating area will include benches and a shade structure. Landscape plantings will encompass the perimeter of the dog park and provide a soft edge and buffer. To learn more about the Sixth Park District Dog Park project, visit the MPRB’s Dog Park project page at www.minneapolisparks.org. There are still some trees left in the 2013 Minneapolis City Trees Distribution Program. The trees are available for Minneapolis property owners can select from nine tree species. This program has been in place since 2006 and is possible through a partnership between the City of Minneapolis and Tree Trust. Pre ordering began March 25 and will continue until all trees are sold out. Trees must be ordered and picked up between May 18-20 at the Minneapolis Impound Lot. On Thursday, July 25, more than 1,200 people attended the 2013 Pollinator Party at Lyndale Park Gardens. This year’s event brought together bees, scientists, beekeepers, food, family fun activities and live music from the Brass Messengers, Dreamland Faces and Summer Breeze. The Pollinator Party provided an opportunity for people of all ages to celebrate the life and work of honey bees and native bees. Bees play a keystone role in the productivity of American agriculture through the pollination of fruits, vegetables, nuts and seeds. Bee enthusiasts were able to learn about honey bees and urban bee keeping, discover the life cycles of honey bees and wild bees and pollination, observe live honey bees, sample Minnesota honey and meet Emily Campbell the 2013 American Honey Princess. Specialists from the University of Minnesota Bee Lab and Bee Squad helped people identify wild bees of the park – including the rare rusty-patch bumble bee. Lyndale Community School invites prospective kindergarten and elementary school parents to learn more about our school. A warm, welcoming community, Lyndale Community School believes that our diversity enriches us all. We prepare the whole child for an ever-changing world while being true to our core values of inclusion, equity, community, and academic excellence. Come learn why East Harriet's community school has been called "a hidden gem" and "the best school in the district." Thursday, January 17, 6:30-7:30 p.m.
Childcare available for children three and older; call 668-4000 to RSVP for childcare. Thursdays and Fridays 9 a.m. or by arrangement. Call 668-4000 to reserve your spot. Join your neighbors at the Lake Harriet bandshell parking lot on Saturday, April 20 for Earth Day. Volunteers will be on hand between 9:30 am and noon to provide bags, assist with registration and answer questions. A limited number of thin cotton gloves are available. We encourage you to bring your own gloves. This annual community event would not be possible without the support and contributions from volunteers, neighborhood groups supported by the Neighborhood Revitalization Program, private businesses, non-profit agencies and community service organizations. Last year 10,000 volunteers helped collect 9,000 lbs of trash! The Minneapolis Recycle Run 5K also serves as a fundraiser for future Earth Day Clean Up efforts. The 2013 event will take place Sunday, April 21, at Lake Harriet. Click here for more information on how to participate in the 2013 Recycle Run. The Minneapolis Park & Recreation Board (MPRB) is currently reviewing its budget for 2013 and severe cuts to the hours of the Lyndale Farmstead Recreation Center building are being proposed. The building hours would be cut to 14 hours per week, down from 27 hours per week currently. This would mean reduced programming at the park. On December 5, the Finance Committee will make its final recommendation to the MPRB Commissioners. On December 12, the MPRB Board of Commissioners will meet at City Hall to approve the 2013 budget. Thank you to those of you that contacted the Commissioners in support of our neighborhood's recreation centers! The Superintendent's Recommended 2013 Budget is available for public viewing on the MPRB website, under News & Events. Pages 9-10 have the details on reduced hours at recreation centers. Take an evening walk of the park with the chance to hear or see one of the many owl species of Minnesota. A guide will lead you through the park as well as through the life of an owl. Meet at the western gate near the Lake Harriet Bandshell. $15.00. Register online or call 612-313-7725. A naturalist will lead a guided hike as you look for tracks and other signs of animals in winter. Many animals stay active in winter or can return in February as nature readies itself for the coming spring. Meet at the Wirth Beach parking lot on Glenwood Ave just east of Theodore Wirth Parkway. $5.00. Register online or call 612-313-7725. Lyndale Community School invites prospective kindergarten and elementary school parents to learn more about their school. A warm, welcoming community, Lyndale Community School believes that their diversity enriches us all, preparing the whole child for an ever-changing world while being true to their core values of inclusion, equity, community, and academic excellence. Come talk with current Lyndale families and learn more about your community school while the children play. Saturday, February 2nd, 9:30-11:00 A.M.
Lyndale School will host the Minnesota Sinfonia on November 28th. The school’s music teacher, Clare Farrell, is organizing the school community to get the most out of this learning opportunity. Teachers have been asked to play the music that students will hear during the concert in their classrooms. This pre-exposure to the music will increase students’ connection with the music when they hear the orchestra perform it live in concert on the 28th. The featured story will be “The Ugly Duckling” and the theme will be “water”. Both the primary (kindergarten -2nd grades) choir and the intermediate (3rd – 5th grade) choir will perform with Sinfonia. The mission of this wonderful orchestra is to share classical music and music education with many audiences in Minnesota. 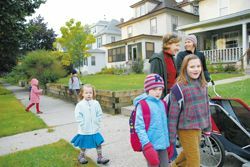 Several years ago Lyndale School parents, including Scott Borden, got the “Walking School Bus” started. Now there are several Walking School Busses that start from different geographic points in the neighborhood. They start with a small group of parents and students at a neighborhood corner 4- 6 blocks from school. As the groups move closer to the school, more parents and students join in along the route. The Walking School Bus is going strong, with the key support of neighborhood parents. A group of Somali and Latina mothers who are involved with the project were featured in a recent district news article from the Multi-lingual Department of the Minneapolis Public Schools. The piece acknowledged the efforts of these parents and the bonds of friendship that have grown between them. Their connections have gone beyond the Walking School Bus project and include participation in English Learner classes at Zion Lutheran Church. Zion happens to be a church with a special relationship with Lyndale School for another reason, too. For many years Zion has served as the emergency relocation site where students and staff would relocate if the need arose. The University of Minnesota Athletic Department sponsors a project in three Minneapolis schools that gets students thinking about their post high school educations. Goldie, the gopher mascot for the University sports’ teams, came to visit the fifth grade classes on November 9th. A few days later the students went on a field trip tour of the University of Minnesota. Students at Lyndale School are participating in a program that provides students with a serving of a fresh fruit or vegetable every afternoon. The program is sponsored by the U.S. Department of Agriculture, administered by Minnesota’s Department of Education and coordinated by the MPS Culinary and Nutrition Services. Children’s response to the program so far? : “We like the fruit days!” Examples of garden veggies and fruits that children have had the chance to try are zucchini, yellow summer squash, blueberries and raspberries. The Lyndale School tradition of students taking the stage to share what they are learning is alive and well. On November 30th the focus of the 5th graders’ showcase will be the learning that the students are doing in Arabic class. This is the fourth year that Arabic classes have been offered at Lyndale School. Why Arabic? It turns out that Arabic is spoken in many countries spreading across the Middle East and northern Africa. Arabic is among the top six languages spoken in the world. Arabic classes at Lyndale School focus on the language and cultures of the countries where it is spoken. One reason Arabic is a good choice for Lyndale School is that Arabic is one of the main languages spoken in Somalia. Lyndale School is a “Somali school site” which means a significant part of the school’s population is Somali students (about 40%). Arabic is one of the main languages spoken in Somalia. Native American drummers, including Ned Yo-yo will perform at Lyndale School on November 15th, Native American Parent Involvement Day. Native American parents were personally invited to the school that day and will be our honored guests. All parents are invited and welcome. 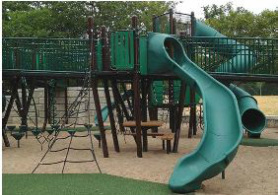 Thanks to the support of the Parks and Trails Fund, children will enjoy new custom playground equipment and picnic amenities this summer at William Berry and Beard's Plaisance Parks at Lake Harriet. A dedication of both play areas was held on July 17 from 6-7:30 pm at the William Berry Park, 3810 Richfield Rd, followed by food and beverage and fun kid and family activities. Bryant B.E.A.T! is an exciting partnership between EHFNA and Barton Open School that shows neighborhood residents how each of us can improve our community's environment. From alternative energy sources to clean water to clean air, we can all work small habits into our lives that, taken together, will greatly improve the quality of our natural resources. Bryant/BEAT! tells us what works and how we can each make a difference. Now in its fifth year, a 7th and 8th grade environmental science class is tackling an energy conservation curriculum and helping the school expand its recycling program. If you'd like to be involved, please contact us via email or at 824-9350 to learn how you can contribute. You can make a difference by volunteering as a Minneapolis Public School K-3 literacy tutor. Training will be available in the new literacy curriculum used by all students in kindergarten through 3rd grade throughout the entire district. For more information and to join or schedule training, email Abe Wofse or call 612.668.3939. The LHiNC Environment Committee, in partnership with the Audubon Chapter of Minneapolis, East Harriet Farmstead Neighborhood Association, and the Minneapolis Park & Recreation Board (MPRB, is co-sponsoring buckthorn pulls at Roberts Bird Sanctuary (follow signs at the Visitors Shelter at the east entrance). Gloves and tools are provided. Wear layers and bring your own water. Your help is needed! The Minneapolis Park and Recreation Board (MPRB) approved the location (site 32) and design for a dog park in the Sixth District at its December 7 meeting. The new dog park will be located along King's Highway in Lyndale Farmstead Park in what is now the lower section of the Southside Operations Center parking lot. This site was the primary recommendation of the Citizen Advisory Committee (CAC), appointed by the board in February to recommend a preferred location and design for an off-leash recreational area on the eastern side of the 6th Park District. 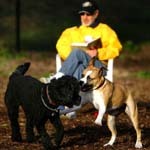 The board also directed park staff, per the CAC recommendation, to develop a system-wide master plan for off leash areas. The MPRB will start work on a design development of the park with a goal to bid the project and start construction by this. A tentative completion date is set for late summer. For more information on the Sixth District Dog Park project, and to review all background information including site maps, concept design plans, budgets and a parking analysis, vist their website at MPRB 6th District Dog Park. Are you 55 and older and have a passion for youth? Become a literacy tutor with RSVP and help children close the achievement gap or others to learn the English language and gain their GED. The RSVP program, sponsored by the Volunteers of America MN, provides benefits and support to people 55 and over. For more information, call Mary Jane Horton, RSVP Literacy Coordinator at 612.945.4163 or mhorton@voamn.org. The Minneapolis School Board (MPS) voted on November 29th to open a new middle school at the Ramsey School building (50th and Nicollet) due to an increased enrollment. Sixth grade students from Lyndale and Burroughs Elementary School will begin the 2012-2013 school year at the new Ramsey location. The first school year attendance will be approximately 170-222 6th grade students growing over the next three years to approximately 600-650 6th - 8th graders. The existing Ramsey Fine Arts School will be moving to a reopened Folwell School building. For more information on the Ramsey School Change, visit http://www.mpls.k12.mn.us/uploads/mid-ramsey_strategy.pdf. Lyndale’s annual International Night on March 29th proved to be a wonderful experience for the large number of students and their families that attended. Each grade level hosted displays and activities featuring different parts of the world. Excited students circulated throughout the building to get their passports stamped after participating in the activities. A completed passport qualified students for a drawing of prizes at the end of the evening. Great Britain was the theme for High Five and Kindergarten. High Five worked on fine motor skills while making castles, double-deck buses, and cutting out and painting Olympic Rings. The kindergarten activity involved matching British words with American Words. Grade one featured ancient North, South, and Central American cultures including Aztecs, Mayans, and Incas. Students enjoyed crawling through the Mayan Temple, making clay beads, and participating in an archaeological dig. Grade two hosted Ancient Greece. On display were many Greek Gods and Goddesses. Students participated in Olympic events including the long jump, cotton ball shot-put, and toothpick javelin throw. Third grade featured Ancient Rome. Time lines and Latin root words surrounded students as they played the ancient Roman game of Rota, which is similar to tic tac toe. Chinese character printing was an activity offered by the fourth grade, which featured China. Grade five presented Japan and offered Japanese calligraphy. In addition to the diverse displays and activities, students and families feasted on a variety of ethnic foods including pizza, tamales, egg rolls, sambusa, Ethiopian Stew, Baklava, and more. International Night was a celebration of the many different cultures that represent Lyndale Community School and the value that each individual brings. This spring, EHFNA is co-sponsoring several garlic mustard pulls at the Roberts Bird Sanctuary (RBS) and William Berry Woods (WBW). Garlic mustard out-competes tree seedlings and other native vegetation with adverse effects on these natural areas. We hope to repeat last year's success in eliminating flowering plants at both sites, to help slow the spread of this invasive plant. Please join us for one or more of the scheduled days and times below. Bags and gloves are provided. Look for the posted signs leading to the pull sites at the visitors shelter at Robers Bird Sanctuary and at the picnic table at William Berry Woods. Kingfield, Lyndale and East Harriet Farmstead Neighborhood Associations are co-hosting a 6th District School Board Candidate Forum on May 10th at Martin Luther King Park from 6:30 to 8 pm. The purpose of the forum is informational and is intended to provide all interested residents in the 6th District with the opportunity to get to know the candidates. The forum will be moderated by the League of Women Voters and will include 6th District Candidates Alex Phung, Curtis Johnson, David Weingartner and Tracine Asberry. An Open House will follow the forum from 8 to 8:30 pm. This is an NCR mandated 21 day notice for a public hearing on a proposal to amend a line item to the East Harriet Farmstead Neighborhood Association's NRP Phase II Parks, Environment, and Schools Funding Strategy (Contract 23192). The proposal is to amend "Barton Environmental Education" to read "Community School(s) of the East Harriet Neighborhood and Magnet or Charter Schools in the East Harriet Neighborhood Initiatives". In years past, only one Public Elementary School had a defined relationship with EHFNA. Now East Harriet has a Community School, a Magnet School and a Charter School. The updated language will reflect that change and the neighborhood's desire to serve all its Public Schools. Barton's relationship with EHFNA will continue unchanged. Public comment will be at the Lyndale Farmstead Park Building at 7 pm, February 27, 2012. If you are unable to attend, you can comment at info@eastharriet.org with "Education Initiatives" in the subject line. The ongoing lack of rainfall is stressful to all trees, especially recently planted ones. Please take some time this fall to make sure your boulevard and yard trees are receiving sufficient water. Here is watering information from the Minneapolis Park and Recreation Board. Each tree that the MPRB plants on boulevards receives two waterings. After the initial watering, it becomes the responsibility of each property owner. Water newly planted trees thoroughly once every seven to ten days during dry periods in the spring, summer, and fall. Trees less than five years old need at least eight five gallon buckets of water slowly poured its roots once every seven to ten days. Another easy way to water your tree is to put a hose under the crown of the tree and run water gently for about an hour. An inch of rainfall each week is what the tree requires. You do not need to water as often when rainfall has been adequate for your tree. Click here to view more information on caring for your trees. The Minneapolis Park and Recreation Board (MPRB) will hold a public hearing on plans for new playgrounds and site improvements within the Lake Harriet area at William Berry Park and Beard's Plaisance. The public hearing will take place on April 20 at 6:30 pm in the MPRB Board Room, 2117 W. River Road. to provide recommendations for these improvements to the MPRB commissioners. Individuals will have an opportunity to speak to the commissioners about the CAC recommendations and concept plans at the public hearing. For additional information and to view concept plans for the project, go online to Lake Harriet Playground webpage. The Sixth District Park Citizen Advisory Committee (CAC) invited the public to recommend a site within the Field, Regina, Bryant and Central neighborhoods as well as the Sixth Park District. Click here to view a map of the designated service area. The deadline to submit a nomination was May 13. Site recommendations received by the public were then submitted to the CAC which will be evaluating the sites using the group's approved criteria. Further information is available on the Sixth District Dog Off-Leash Area CAC website. Daily concerts at the Lake Harriet Bandshell begin Monday, May 30 and run through Labor Day, September 5. Show times are 7:30 pm Monday - Saturday, and 2 and 5:30 pm on Sundays. The Minneapolis Pops Orchestra returns for its 62nd season with five consecutive weeks of Saturday and Sunday performances beginning July 2. Everyone one if welcome to attend these free concerts. Bring your lawn chairs, blankets, picnics and keep your umbrellas handy (concerts may go on on rain or shine). For the most up-to-date schedules and weather related information, visit www.mplsmusicandmovies.com. The MPRB recently restructured the neighborhood park programs creating 13 Community Service Areas (CSA). The new park model will help maximize park services while bringing quality programming to area residents. In addition to Lyndale Farmstead Park, East Harriet residents will also have access to facilities and programs at Martin Luther King, Painter and Fuller Parks. Winter registration begins Monday, Dec, 6 at 6 pm. Park users can register online using the ActiveNet registration program recently launched by the MPRB. You can also register in person or by phone at any of our four CSA parks: Lyndale Farmstead, Martin Luther King, Painter or Fuller. The Minneapolis Park and Recreation Board (MPRB) recently approved the formation of a non-appointed Citizen Advisory Committee (CAC) to provide input into the design of the regional playgrounds and site improvements at William Berry Park and Beard's Plaisance. Ideas and suggestions from the community are both welcomed and encouraged. Construction is tentatively scheduled to begin in the summer of 2011 with both playground sites reopening in the spring of 2012. Additional information and updates are available on the project's web page. A preferred location and design for a dog off-leash recreation site in the Sixth Park District was made by the The Dog Park Citizen Advisory Committee (CAC) at their last meeting on September 12. The final recommendation of the CAC to the Minneapolis Park and Recreation Board (MPRB) was Lyndale Farmstead Park, Southside Operations Center lower parking lot (Site 32). An additional motion was passed that if for some reason the design as presented to the CAC, for Site 32 could not be implemented, then the Lyndale Farmstead Park, Kings Highway and W 39th Street, near the sledding hill next to the Wirth House (Site 1) was recommended as the backup site. The CAC's recommendation will be presented to the members of the MPRB and they will decide how to proceed. Once this meeting date has been scheduled, East Harriet will notify residents on this website and through our eNews. Going forward, interested members of the public can contact the MPRB Commissioners, participate in the Park Board's public comment process and speak at the November 9 meeting at Park headquarters, 2117 West River Rd, Minneapolis. A public hearing will be held on Tuesday, November 22 at 6:30 pm at the MPRB headquarters, 2117 W River Rd.nounced shortly. Requests for public input will be posted on the MPRB website: Sixth Park District Dog Park. Bees play a key role in the productivity of American agriculture through the pollination of fruits, vegetables, nuts and seeds. You can help the bees by learning more about the flowers you can plant to keep bees continue with this important process. Celebrate the life and works of bees on Thursday, July 28. The evening event will begin at 5 pm in the Lyndale Park Gardens. Meet the current "American Honey Bee Queen, Teresa Bryson and enjoy educational games and live music by Quaking Bog. The movie, "Queen of the Sun" will be shown at dusk. This free event is co-sponsored by the Minneapolis Park and Recreation Board and the University of MN Bee Lab. For more information, visit www.extension umn.edu/honeybees and www.xerces.org. Volunteers will be available to help with registration, provide bags and answer questions. Limited number of light cotton gloves will be available, however, it is recommended to bring your own gloves. Mon., August 9, 7-8 pm, Lyndale Farmstead Park, 3900 Bryant Ave.S. Thurs., August 19, 6:30-7:30 pm, Linden Hills Community Center, 3100 43 St. W.
More opportunity for public input, including a survey, will be posted on the MPRB website. Following public input, MPRB will provide technical input during the winter of 2010-2011. The ACM, EHFNA and LHiNC will work with MPRB staff to develop a long term management plan to enhance and protect the sanctuary. The final plan will be presented to the MPRB Board of Commissioners for approval and adoption in the spring of 2011. Check out the Minneapolis Park and Recreation Board's (MPRB) Winter Guide is now available online. Just in time for the winter break, this guide offers many family friendly winter recreational opportunities at parks, lakes and recreation centers throughout the city. 175 residents including 30 Southwest High School students, two Girl Scout troops and 15 members of the Bassmasters Fishing Club, turned out on Saturday, April 17 at Lake Harriet to participate in Earth Day. Thanks to everyone who helped with the clean-up. To learn more about the impact Earth Day has on Minneapolis, click on minneapolisearthday.org. The Minneapolis Park and Recreation Board (MPRB) is seeking Request for Proposals (RFP) for highly qualified operators to assume management of the concession operations at Lake Harriet. RFP's are due by 4pm Fri., July 9, 2010 and the facility opens to the public by April 2011. The RFP is available online at www.minneapolisparks.org and at MPRB HQ's located at 2117 W. River Rd. The Lake Harriet Citizen's Advisory Committee (CAC) developed recommendations on community preferences for the operation of the Lake Harriet Concession. The work of the CAC included extensive outreach and community input. Any potential vendor should review the report and incorporate the findings of the concept for the Lake Harriet concession venue and operation. The Minneapolis Park and Recreation Board (MPRB) approved the formation of the Lake Harriet RFP team that will be comprised of MPRB staff and members from the Lake Harriet CAC who have an interest in participating in the Request for Proposal (RFP) and award stages of the project. The RFP Review team is scheduled to be formed and approve the evaluation process and recruitment strategy in March 2010. Requests for Proposals are expected to be sent out in April with analysis of proposals to begin in early summer. Vendor selection is slated for the fall of 2010. Concessions will continue to be available at the Lake Harriet Pavilion this year as they were last season. For more information please visit www.lakeharrietcac.nig.com or contact Matt Perry at mattp@pobox.com or call 612.839.3320. Lyndale Community School is working in conjunction with the Minneapolis School District encouraging more students to walk to school. The program called Safe Routes, provides safe and reliable "walking school buses" for students. 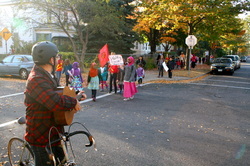 Lyndale School kicked off their Walk/Bike to School Day on April 22. Parents will lead the 'walking school bus" every Tuesday and Thursday until the end of the school year. All students are invited to join. The goal of Safe Routes is to promote physical activity among young people. East Harriet residents are invited to a special evening of Shakespeare on the Playground on Wed., June 2nd at 6:30 pm. Mr. Pederson's 5th graders will perform "A Midsummer Night's Dream". Artist in residence, Buffy Sedlachek, has been teaching Lyndale students about Shakespeare, which is part of Lyndale School's core knowledge sequence. Ms. Sedlachek adapted the play for children to one half hour while retaining much of it's original flavor and language. Funding for this project came from the Jungle Theatre. Following the performance, neighborhood guests will be treated to barbecue on the playground. Click on Lyndale Community School to learn more about East Harriet's community school. Minneapolis Park & Recreation Board will be appointing three community members to the newly restructured Minneapolis Bicycle Advisory Committee (MBAC). If you are interested in serving on this committee and having a voice regarding bicycling in Mpls, you are encouraged to fill out an application. Applications will be accepted until 4:30 pm Wed. Dec. 22. Appointments will be made before the first meeting scheduled on Wed. Jan. 5. from 10 to 11:30 am. East Harriet, Kingfield, Lyndale, CARAG and ECCO neighborhood organizations will partner with Hennepin County to sponsor a convenient neighborhood collection event for residents to safely and properly dispose of their unwanted garden and household hazardous wastes on Saturday, October 9. WHEN: Sat., Oct. 9 from 9 a.m. to 1 p.m.
WHERE: Minneapolis Park Board Southside Operations Center Parking Lot, 3800 Bryant Ave. So. ; Enter off Kings Hwy/Dupont Ave.
Be sure to bring your ID to drop-off; residency in Minneapolis will be verified. For a list of Accepted and Non Accepted materials, click on Hennepin County's Neighborhood Hazardous Waste website. Household Hazardous Waste Drop-Off Event a success! East Harriet, Kingfield, Lyndale and CARAG Neighborhood organizations partnered with Hennepin County to sponsor the annual neighborhood collection event for residents to safely and properly dispose of their unwanted garden and household hazardous wastes on Saturday, Sept. 26. Thanks to the combined neighborhood associations and volunteers, the event proved to be a success with 166 residents from nine neighborhoods dropping off items. To read how the MPS district is preparing for the 2010-2011 school year transition, visit MPS Transition. On May 6, Superintendent Bill Green issued a statement that the previously announced community engagement meetings for May would be postponed as would the board vote on May 26. A new schedule is expected to be shared with families and communities within the week. May 26: School Board Vote for phased implementation of changes in the 2010-11 school year. POSTPONED TO LATER DATE. The Minneapolis Public Schools Administration posted on the MPS web site this afternoon the recommendation they will be presenting to the Board of Education at their April 28th meeting regarding changing school options. You can get to the recommendation by clicking here. In advance of the recommendation being formally presented, the East Harriet Farmstead Neighborhood Association (EHFNA) Board of Directors sent a letter to the Minneapolis Board of Education requesting our neighborhood boundaries be honored in drawing attendance areas and an offer to be a partner in reaching out to the community in identifying programs and facilities that might be part of the community school for our neighborhood. We attached to that letter the EHFNA adopted "Guiding Principles for Strong-Neighborhood Synergy." These documents were sent to the Board of Education on April 24, 2009. You can download the letter sent to the Board of Education HERE. You can download the Guiding Principles for Strong-Neighborhood Synergy HERE. We will be posting more information on how we will be reaching out to the community and further engaging with the Board of Education and the MPS Administration. Please check back here soon. We want to hear from you. If you have questions, comments or concerns please contact us at info@eastharriet.org or 612-824-9350. Additional EHFNA contact information can be found on Contact Us page HERE. Nearly 200 F2 Open Area neighbors (Kingfield and East Harriet) attended a meeting on Monday, March 23 to learn more about Minneapolis Public Schools proposed changes in 2010. The discussion with Jackie Turner, Head of Minneapolis Public Schools' (MPS) Student Placement, addressed potential school attendance and program changes and the District's viewpoint on how changes may impact Open Area F2. For more information on the program changes being explored by MPS to implement in Fall 2010, visit the MPS website: http://mpls.k12.mn.us/.